Everything looks good. The tech did say that the aorta "curls funny", but I don't think it's a problem, since she would likely not have said it out loud. Thumper is breech right now, so we're really hoping that s/he will turn soon! 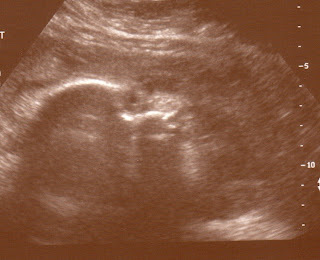 I am 30 weeks today, so only 10 more to go! Here are the pics I got yesterday. In the first one, Thumper was sticking out his/her tongue - kind of suckling. Awww!! And, don't you just want to kiss the chubby cheeks in this one?? So cute! I won't have the actual results of the u/s until my next Dr. appt. 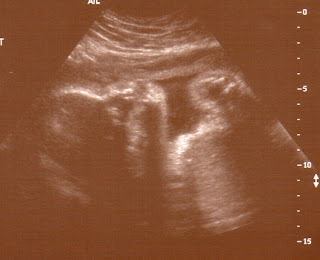 There was some concern that the baby's abdomen was measuring 3 weeks ahead at my last u/s, which is an indicator for GD. I *don't* have GD, but I do have Glucose Intolerance. Well, duh. ;) I get to go to a dietitian next week, and get a glucose monitor to check my sugars for a few weeks. Yay. Awww! Such chubby cheeks! What a great picture! Only 10 weeks left, woo hoo! I was thinking to myself that I have only 13 weeks left, and I remember when I was only 13 weeks pregnant, and I thought I had SUCH a LONG time left, but it's gone by in a flash! Ten weeks is nothing! Yep, definitely a chubby little thumper. I was looking at baby pics of Ethan today, and he was FAT. Really quite fat! Rolls and everything. And now look at him. Goes to show you, Adeena never feeds her kids. Ten weeks is an insanely low number. Where has the time gone? I thought you guys were *just* telling me like two weeks ago that you were pregnant!